Canine Therapy Corps has approximately 65 active volunteer teams working in programs across the Chicago metropolitan area. each year we provide 1,400 hours of therapy to more than 5,000 individuals AT NO CHARGE TO ANY CLIENT OR FACILITY. We have many more volunteers without dogs who assist with our Certification test, evaluate our program efficacy, plan special events, and ensure that Canine Therapy Corps remains an innovative and exciting organization. Our volunteers work in the Yacktman Pavillion, providing animal-assisted therapy within outpatient pediatric therapy services. Volunteer teams work one-on-one with young children and their therapist. In this exciting program, the therapist works directly with the volunteer to identify goals within the speech, occupational and/or physical therapies for each young client. This program, located within the Sager-Solomon Schechter Day/Middle School in Northbrook serves children aged 5-13 years old on the autism spectrum, some with physical disabilities as well. Program goals include improved communication, sensory processing, and social skills. CTC is proud to have developed a portfolio of proprietiary materials for use in our programs for children with autism and other cognitive and developmental delays. Polly is one of many dogs who help children reduce anxiety while waiting for their appointments at Chicago Children's Advocacy Center. Our volunteers visit with children, who have suffered sexual abuse and assault, awaiting appointments with treating professionals at a multidisciplinary facility. This program, which started in January 2009, is designed to meet the varying needs of students on the autism spectrum. Goals include improving sensory processing skills, social and communication skills and memory, as well as activities for daily living and increased impulse control. CTC is proud to have developed a portfolio of proprietary materials for use in our programs for children with autism and other cognitive and developmental delays. Therapy dog Kayla navigates an agility course with a Haymarket Center participant. Canine Therapy Corps teams work with chemically dependent individuals in rehabilitation, some of whom are in residence as an alternative to serving jail time. The program follows our award-winning curriculum developed to improve communication skills, anger management, self-esteem and self-awareness. During this six-week program, participants work with the dogs on progressively advanced obedience and agility, culminating in a graduation where each participant demonstrates proficiency in dog handling. The program helps to break the cycle of crime, personal violence and neglect that often accompanies substance abuse. Rudy works with teenage boys at Heartland Alliance's Specialized Care for Immigrant Youth program. Visitation with teenaged boys, temporarily residing at two group shelters for unaccompanied, immigrant minors, awaiting repatriation or reunification with their families. Therapy dog Swindle works with veterans during this ten-week program. This psychosocial program is for veterans being treated for a myriad of mental illnesses, such as chronic post-traumatic stress disorder, severe depression, and other mental illnesses, at the hospital's outpatient psychosocial rehabilitation and recovery center. Simply stated, participants' work with our dogs is empowering. There are infinite parallels between successful dog handling and coping with life's peaks and valleys. In order to build a strong bond with a dog, one must be patient, consistent, flexible, and perseverant, but also caring, understanding, respectful, and fair. 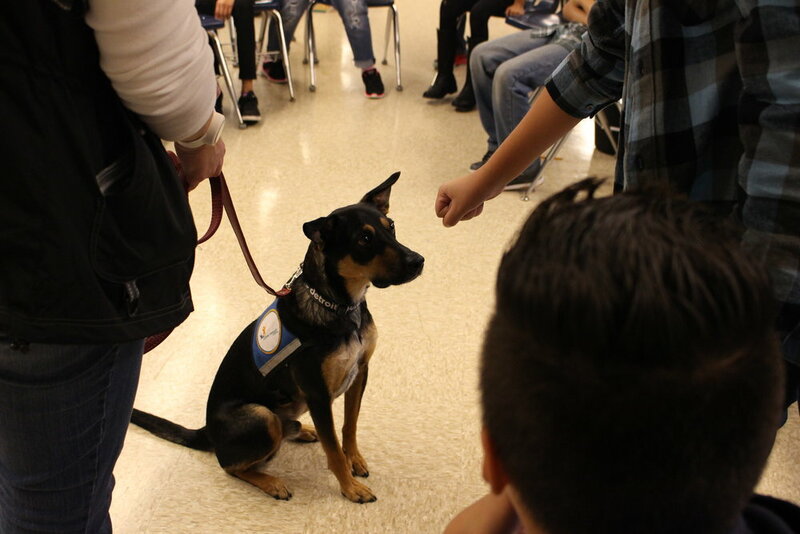 Each participant works with one therapy dog throughout the curriculum, using obedience and agility exercises, as well as trick training, to cultivate their relationship. Typically, when participants begin, they do not fully comprehend the inextricable link between their own behavior and therapy dog compliance. As the curriculum progresses, so, too, does participant impulse control, confidence, and perspective - key recovery components. Therapy dog Rocko eagerly awaits instruction from participants. 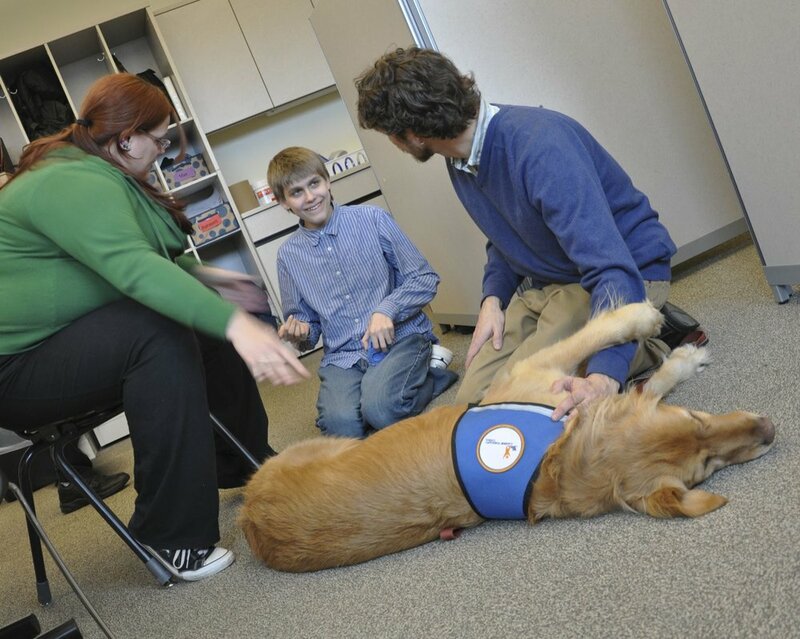 Canine Therapy Corps teams work with adolescents and teens with severe emotional and behavioral problems at this not-for-profit child welfare agency. The program follows our award-winning curriculum developed to improve communication skills, anger management, self-esteem and self-awareness. During this ten-week program, participants work with the dogs on progressively advanced obedience and agility, culminating in a graduation where each participant demonstrates proficiency in dog handling. Therapy dog Lexi visits with a patient at Northwestern Memorial Hospital. Volunteer teams visit inpatients and outpatients in medical, oncology, and neuro/ortho/spine departments. Some of these patients have been hospitalized or even bedridden for weeks or months, and the presence of a dog brings great comfort to these individuals during a very trying time in their lives. In 2015, CTC therapy dog teams visited 1,383 patients in this facility. We regularly visit a number of floors at the facility, and in addition we accommodate special visits requested by family members, social workers, and the patients themselves. We have often provided companionship during the last days and hours of patients’ lives. (Left to right) Harvey, Jae, Payton and Mango assist patients in physical rehabilitation. This group program is for adult inpatients undergoing physical rehabilitation. This group program is structured very similarly to the Rehabilitation Institute of Chicago and Swedish Covenant Hospital. Our pilot at this facility began in September 2016. 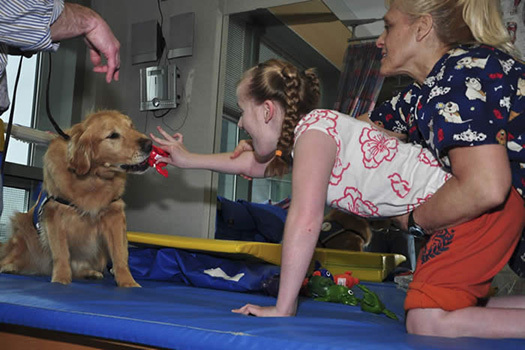 Therapy dogs work with physical rehabilitation patients of all ages in this group program. Our program at this prestigious facility (formerly the Rehabilitation Institute of Chicago) works with clients of all ages who are recovering from head trauma, spinal cord injuries, burns and a variety of other catastrophic occurrences. Volunteer teams use agility equipment and other recreational techniques to motivate clients to regain mobility, strength, balance and the ability to lead independent, productive lives. This is the site of the published research study on the impact of animal-assisted therapy on ambulation. This program began in April 2006 as part of the Planetree Initiative for patient centered care. Canine Therapy Corps volunteers work with adult rehabilitation patients selected by the inpatient allied health supervisor from the general population of the inpatient census at the hospital. The goals of the program include increased functional balance, range of motion and upper extremity strength, increased mobility and endurance for increased independence, and to provide socialization opportunities while recovering from physical trauma. In addition, the program provides exercises to address cognitive and visual perceptual tasks.